Are you ready to work in a position for more than 10 years? The answer will not be so easy and even may irritate some carrier hunters. A 94-year old man has grabbed the headlines by his deep love for his work. Kottarappu Chattu Kuttan worked for 72 years as a doorman at the most famous hotel in the Sri Lankan capital, Colombo. He started as a waiter and never retired from his job at the Galle Face Hotel. Kuttan emigrated from his native Kerala in southern India aged 18 in 1938 after his parents' death. Looking for work, he finally joined the Galle Face in 1942, where he worked until his death. We spend most of our lives at work. That’s why it must be a source of pleasure, joy and optimism for us. Of course, it would be nice if we could enjoy everything we do. However, only few people can experience such an enjoy in their lifetime. As a rule, people either like or dislike something in their jobs. Constant pressures, high requirements, overworking and other similar reasons usually force them to think about changing their job. Monster.com and market research company GfK have conducted a study, which revealed that only 53 percent of Americans actively enjoy their jobs and 15 percent actively dislike them. Canadians, meanwhile, took top prize for having the cheeriest workforce: Some 64 percent of Canadians like their jobs, while only seven percent hating what they do. In 2010, Russian hh.ru web-site conducted a survey on "why you feel unhappy at work" among 748 correspondents. As much as 37 percent of people said that they are not satisfied with their wages. Almost 12 percent of them noted that they are dissatisfied with their relations with colleagues, while eight percent complained about the poor working conditions and nine percent said that their jobs inhibit their professional progress. 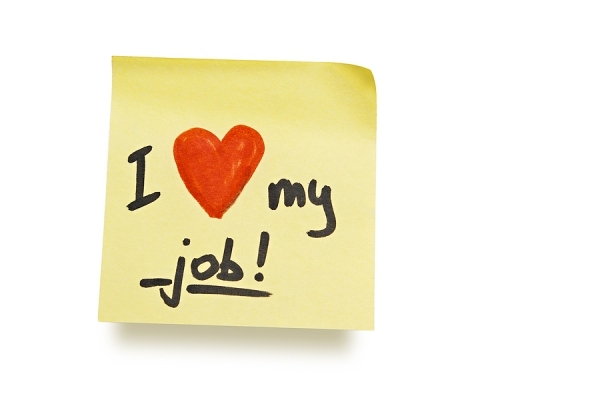 Those who are unable to change their jobs due to various circumstances must learn to love it. If you cannot change the situation, change your attitude to it. For a start, it is better to work with the concept of “Work to live, not live to work”. It is very difficult to find a job that brings you both happiness and satisfaction: a job that you don't get tired of or feel boring and stress. Generally, it is better to remind yourself that the work is just a part of your life and you don't need to strain your nerves over it . Some people get nervous, because they are afraid to make an error. But, errors are our teachers and valuable personal experience. I'm sure that you will agree with me that the most pleasure of each job for almost all of us is its adequate material compensation. Salary acts as the biggest incentive for all employees. One more tip, which can help you is to apply the law of “to pretend until you believe it”. So, pretend that you love your job and after some period it will work. When I get tired of work, for example, I like to read quotes of influential people about this issue. My favorite quote is “do something pleasant to anyone”. In many cases it helps. You come to think about other people, forgetting your own problems. You stop feeling sorry for yourself and realize that you are not alone on earth. Because giving joy to others, you make happy yourself as well. Do you know that "the best profession in the world" lasted only for six months. The vacancy was opened in 2009 by the tourist company of Queensland, Australia. 34 year-old Ben Southall was selected from 34,000 applicants. His duties included the description of his adventures in a video blog to promote the islands of the Great Barrier Reef and develop tourist business. His salary was $17,500 per month. To me, doing what you love will bring you enjoyment and you will feel more perfect. Do what you love. Then you’ll never feel you ever work throughout your life.